What is minimally invasive, laparoscopic surgery? Many surgeries now can be performed with several tiny incisions ranging from 3mm-12mm. A camera is inserted inside your abdomen, and your operation can be performed with long instruments rather than the traditional open approach (large incision on your abdomen). ​Maybe you can have even SMALLER incisions for your surgery. 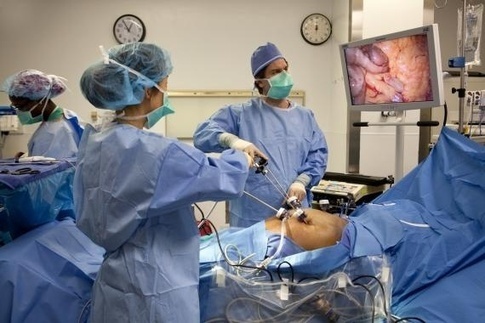 Click here to learn more about "Mini-Laparoscopy"
Robotic Surgery is a method of minimally invasive surgery in which the da Vinci robot is used. Operations are performed with several small incisions and features a magnified 3D high-definition vision system with tiny wristed instruments that bend and rotate providing enhanced vision, precision and control.